They say comedy is the result of tragedy plus time, and in the 2014-2015 NBA season, that saying has never been more true. If you don’t believe me, look no further than the dregs of the Eastern Conference. On the one hand, you have the Sixers, who despite being a terrible team, never expected anything more. They’re looking for a high draft pick as part of a broader rebuilding process, and they don’t really care to do too much otherwise. Hell, they even changed their promotion with Papa John’s, which originally called for discount pizza when the team won. After that more-than-slightly-pathetic 0-17 start, the deal became discounted pizza if the team scored at least 90 points. Congrats fans, your team may have lost by 35 points, but they scored 90 in the process, so enjoy the pepperoni. The players, the fans and Papa John himself all understand that the Sixers are losers, but they were meant to lose this season. They just want to learn and maybe one day, get better. Then you have the Knicks. 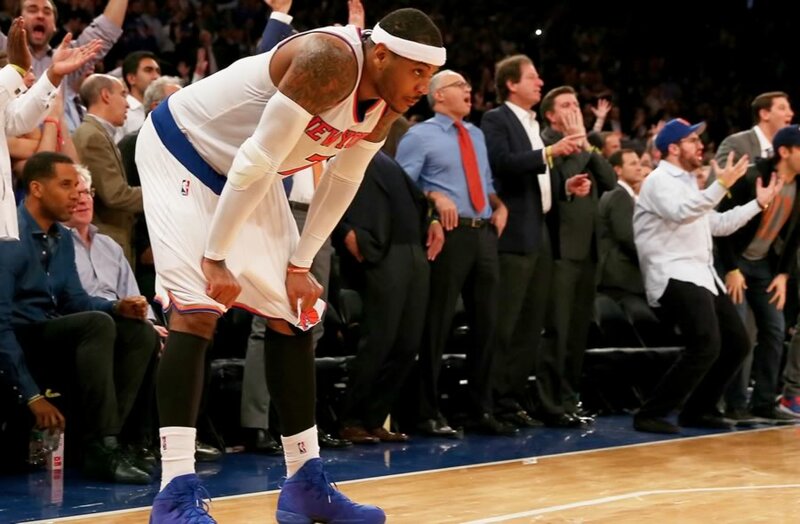 The Knicks are the definition of dysfunction in the modern day NBA. They have an overpriced superstar, role players who don’t know how to role-play (though I’ve heard Iman Shumpert does a pretty great British accent) and a first year coach in WAY over his head. Less than three months into the season, there were reports that Knicks players wanted to beat each other up. You think Steve Kerr ever really considered coaching the Knicks over the Warriors? I can just see the discussion now. Phil Jackson: Pretty please? We’ll name a subway station after you! What’s truly frustrating and/or hilarious, depending on which point of view you have, is that the Knicks are actually trying to win. They are feisty and competitive, but flat-out terrible. They have arguably the worst chemistry since Ben Affleck and Rebecca Hall played a bank thief and his love interest in “The Town.” Since the Knicks started 2-1, they’ve gone 3-24. Over that same time span, the Sixers are 3-20. So to recap, the team that’s not trying is currently outperforming the team with a payroll 100 times the size, and about 150 times the NBA experience (roughly estimated). I’m pretty sure I’ve been to an NBA arena as many times as the current Sixers roster. Honestly, I wouldn’t be surprised to find out that the Sixers bench includes at least one stadium concessions vendor and one European tourist who got mugged in Philly and is trying to buy back their airfare home. So where do we go from here? Well, if you’re a fan of either team, start by keeping your Kleenex handy and brace yourself for a long few months ahead. But don’t worry too much. After all, comedy is tragedy plus time (or so I’ve heard), so hopefully you’ll find the humor in your team’s misery and be able to start laughing at it all soon enough. Especially if you get rewarded on draft day. A gentleman's scholar, the good doctor first turned the sporting world upside down when he introduced the concept of "hydration." Now, he shares his witty rhetoric and curmudgeonly attitude with anyone who will listen.